Two hundred and fifty-sixth pope; born at San Arcangelo, near Rimini, Oct. 31, 1705; elected May 19, 1769; died Sept. 22, 1774. His election was hailed with particular joy by the Jews, who trusted that the man who, as councilor of the Holy Office, declared them, in a memorandum issued March 21, 1758, innocent of the slanderous blood accusation, would be no less just and humane toward them on the throne of Catholicism. In this they were not deceived. Two months after his accession Clement XIV. withdrew the Roman Jews from the jurisdiction of the Inquisition and placed them under that of the "Vicariato di Roma" (Aug. 5, 1769). 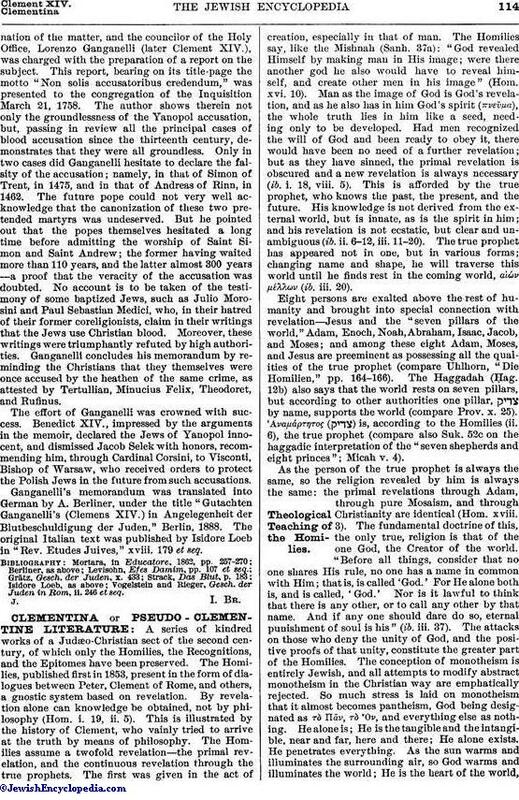 Another token of his benevolence toward the Jews was the confirmation (March 29, 1773) of the bull of Clement VIII. concerning the Jus Gazaka, which was of very great importance to the Roman Jews. The memorandum of Clement XIV. (Ganganelli), referred to above, deserves special mention, as much from the importance of the subject treated therein as from the great authority of its author. It was called forth by a blood accusation against the Jews of Yanopol, Poland. Alarmed by this frequently repeated accusation, the Polish Jews sent one Jacob Selek to Rome to implore the protection of the pope. Benedict XIV. thereupon ordered a thorough examinationof the matter, and the councilor of the Holy Office, Lorenzo Ganganelli (later Clement XIV. ), was charged with the preparation of a report on the subject. This report, bearing on its title-page the motto "Non solis accusatoribus credendum," was presented to the congregation of the Inquisition March 21, 1758. The author shows therein not only the groundlessness of the Yanopol accusation, but, passing in review all the principal cases of blood accusation since the thirteenth century, demonstrates that they were all groundless. Only in two cases did Ganganelli hesitate to declare the falsity of the accusation; namely, in that of Simon of Trent, in 1475, and in that of Andreas of Rinn, in 1462. The future pope could not very well acknowledge that the canonization of these two pretended martyrs was undeserved. But he pointed out that the popes themselves hesitated a long time before admitting the worship of Saint Simon and Saint Andrew; the former having waited more than 110 years, and the latter almost 300 years—a proof that the veracity of the accusation was doubted. 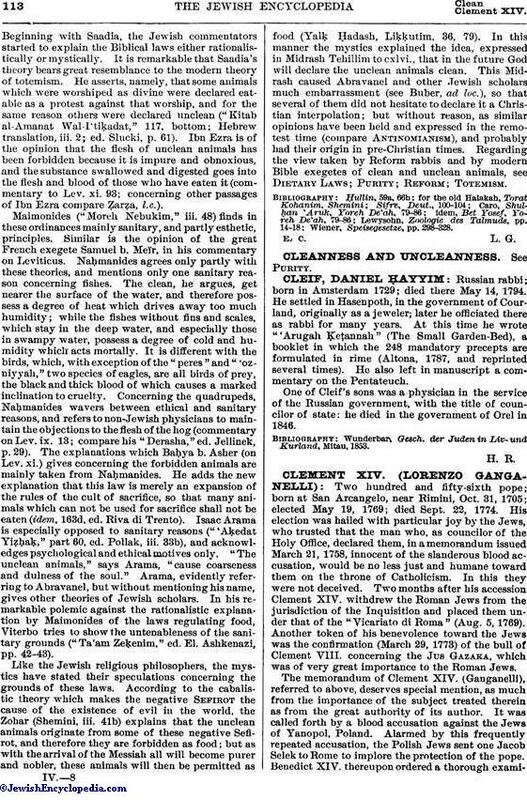 No account is to be taken of the testimony of some baptized Jews, such as Julio Morosini and Paul Sebastian Medici, who, in their hatred of their former coreligionists, claim in their writings that the Jews use Christian blood. Moreover, these writings were triumphantly refuted by high authorities. Ganganelli concludes his memorandum by reminding the Christians that they themselves were once accused by the heathen of the same crime, as attested by Tertullian, Minucius Felix, Theodoret, and Rufinus. The effort of Ganganelli was crowned with success. Benedict XIV., impressed by the arguments in the memoir, declared the Jews of Yanopol innocent, and dismissed Jacob Selek with honors, recommending him, through Cardinal Corsini, to Visconti, Bishop of Warsaw, who received orders to protect the Polish Jews in the future from such accusations. Ganganelli's memorandum was translated into German by A. Berliner, under the title "Gutachten Ganganelli's (Clemens XIV.) in Angelegenheit der Blutbeschuldigung der Juden," Berlin, 1888. The original Italian text was published by Isidore Loeb in "Rev. Etudes Juives," xviii. 179 et seq. Vogelstein and Rieger, Gesch. der Juden in Rom, ii. 246et seq.